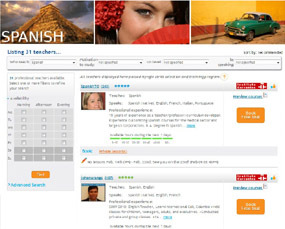 Myngle is the No.1 Global Multi Language School Online. Choose from over 40 languages and learn online on demand 24/7 regardless of location or schedule. Whether you need a minor language improvement or learning from basic to proficient we have the flexibility to offer you the best solution. Select the language you would like to learn, your native language and your current level of the language and we will show you a list of teachers who fit your needs. On the profile of our teachers you can read about their experience, the languages they speak and the feedback they received from other students on Myngle. If you like the teacher you can find their schedule and prices here as well. You can try a lesson for free by booking a trial lesson to get to know your teacher. From the teacher profile it's easy to book and buy your first lesson. On the booking page of the teacher you can choose between booking 1 individual lesson or buying a lesson package of 10, 30, 50 or 100 lessons. 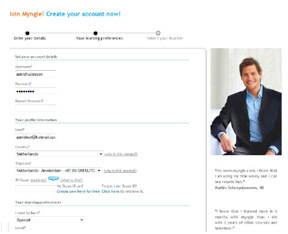 Myngle is secured for safe transactions; PayPal, Major Creditcards, iDeal and bank transfer accepted. At the time and date of your lesson, login to Myngle. On your MyMyngle, or on your homepage you will find the Myngle Virtual Classroom. You can enter the classroom as soon as your teacher has opened it for you. You will notice that your teacher is ready by seeing a light box appearing in your MyMyngle or on your Homepage with the message "enter the classroom". The Myngle Virtual Classroom is the place where you meet your teacher. You will learn by speaking, listening and writing with your teacher. This can be done through a whiteboard where you and your teacher will work together with the course material. Depending on your needs, Myngle will help you reach your goals. You will take lessons in real time, and will receive constant evaluation of your teacher. 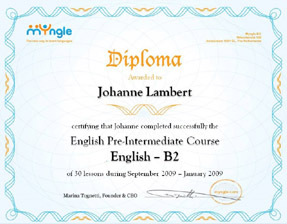 You can evaluate and track your progress with our assessment test and receive your official Myngle Language Diploma certifying your level.